Children's Complete Multivitamin+ Iron Gummies, Natural Fruit Flavors. FDA Disclaimer: *These statements have not been evaluated by the Food and Drug Administration. This product is not intended to diagnose, treat, cure, or prevent any disease. CREATED BY A PEDIATRICIAN Zarbee's Naturals Children's Multivitamins with Iron are an effective daily vitamin for healthy growth, development, and to support a strong immune system*. Ideal for kids to help supplement nutritional gaps in their diet. 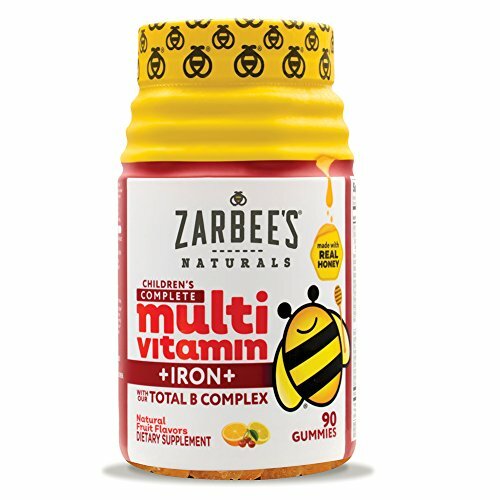 SAFE & EFFECTIVE Zarbee's Children's Multivitamins with Iron are a source of 13 essential vitamins & minerals including A, C, D3, & B complex, in a naturally-flavored, easy to chew honey-sweetened gummy. With iron to help support a healthy metabolism*. WHOLESOME INGREDIENTS Our vitamin gummies are made with vegetarian pectin so they're soft & easy to chew & taste great in natural mixed fruit flavors. Made with no drugs, alcohol, high-fructose corn syrup, artificial sweeteners or flavors. Gluten free. GREAT KID'S GUMMY Our Children's Multivitamins are tasty and easy to chew, making them an ideal gummy for your growing child. This gummy is specially formulated for ages 2+. Includes our total B Complex.